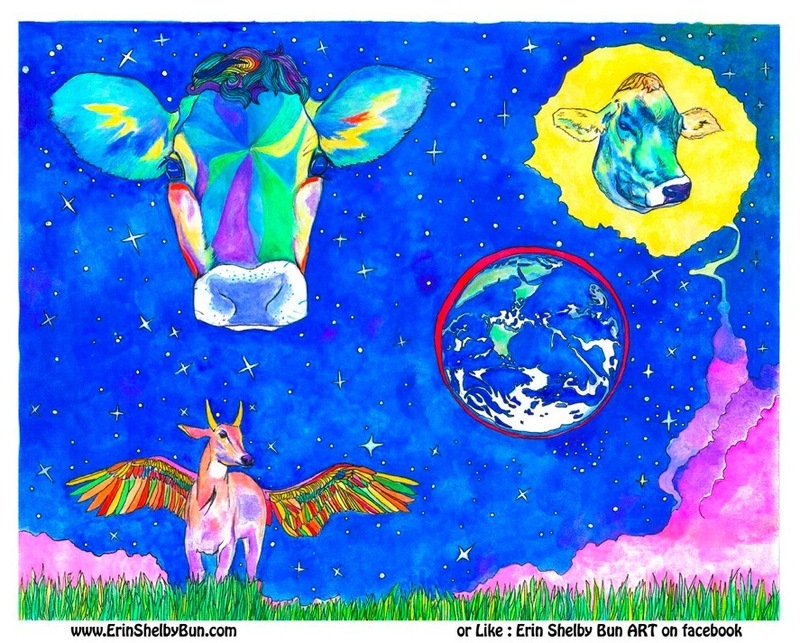 This painting I made while thinking of the spirit of the cow. I wondered how they must feel about Earth, a place where billions of their brother, sisters, moms and dads have suffered and died. The cow with wings represents hope that things will change here for them, the large face to the left is the innocent soul of them alll and the face in the yellow represents the cows who are upset with humans....but of course are willing to forgive if we start making changes fast!! The red around the Earth represents not only the suffering of animals but of Earth’s suffering. The Earth is being polluted by animal agriculture and the government is ignoring this issue because the meat industry/animal agriculture make them MONEY! We can change this though! If no one supports these horrible industries they will be gone-and the Earth, animals and humans will HEAL!